Besides it difficulties these mountains are notorious for heavy storms, fast changing and extremely bad weather. This area provides a lot of different hiking possibilities of all severities. The base town El Chalten is appointed as "La Capital Nacional del Trekking". 30 years ago just one house was here which served as police station, hotel, supermarket, post office ... . Now El Chalten is a bustling tourist destination for several thousands of visitors every summer. El Chalten is the name of the native tribe Tehuelche for Cerro Fitz Roy. It means smoking mountain, because there are usually clouds around its top. We arrived at the southern arm Brazo Sur of Lago Argentina in the evening of December 27th 2011. There is the beautiful free campsite El Huala close to the park entrance without any facilities (GPS coordinates: S50° 31.745' W72° 47.344'). We were happy to see Angie and Phil there, which we had met several times before. They are several years on tour with their Iveco, see www.philflanagan.com. Behind the campsite starts the 4 hours trail to the 1261 meters high Cerro de los Cristales (GPS coordinates summit: S50° 34.008' W72° 46.862'). It offers fantastic views to the landscape. The trail starts at the street on S50° 32.350' W72° 48.021'. Cerro de los Cristales means mountain of the crystals. We saw some but we believe mountain of the flowers is more adequate, because there were hundreds of different flowers. Indeed the austral summer started yet. Another good name might be mountains of the wind, because the storm on its top was violent. We had serious trouble to walk uprightly. 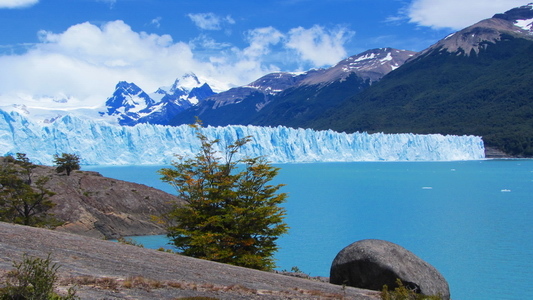 The glacier Perito Moreno Glaciar is a must to see in Argentina. According Lonely Planet it is the number 1 wonder of the nature in Argentina. Thus we headed to entrance and paid the extraordinary fee of 25 bucks per person. It is a little bit like Disneyland with several kilometers of iron ways, railings and stairs; a lot of displays and too many people. But it is every Dollar worth; you have unforgettable and spectacular views. Our idea was to do the Vuelta, the circle around Cerro Torre and to cross a small part of the huge Campo del Hielo Sur which is the largest continental ice-field outside of Antartica (length: 400km, width: up to 80km). The weather forecast was excellent for the first five days of 2012: Much sun, comfortable temperatures and just a little bit wind. Only some showers were predicted on New Year's Eve. This circle is a tough six day tour because you have to carry ice equipment like crampons, rope, tent, food for six days, good sleeping bags and proper clothing. Consequently we started this trip with heavy boots and backpacks at lunch time on December 31st 2011. According to our guidebook Patagonia from Rother it is a reasonable 5 hours trip on a good track. You have to cross the river Rio Pollone just few minutes before the first comfortable campground La Playita on the West shore of Lago Electrico, which provides good shelter against wind. Maybe you have to remove the shoes to traverse the river. On the following day you enter the Campo del Hielo Sur via the Paso Marconi. We never came to La Playita. But we reached Rio Pollone. We removed our shoes and tried to cross it. The first arm was very deep, maybe up to the thigh. The water was very cold. The current was enormous. But we managed it. Several smaller arms followed and there was the last one. Too deep, too rapid, too dangerous! Besides it was very windy, even stormy. Maybe we can do it in the morning on the next day, because it was very warm and the snow was melting like hell. We hoped that the New Year's Eve night becomes cold, very cold! We searched for a good campsite with some wind protection. Very difficult! But somehow we were able to put up our red large tent. Tommy wanted to use the smaller green tent. But the storm hit so hard that one of the rope pulls break. No chance to mount it. We three had to sleep in one tent. It became dark (at 10:30PM! ), it started raining and the wind was rattling against our tent. But we were so exhausted that we fell asleep immediately after our short dinner. Marion awoke with a cramp in the calf few minutes before 12:00AM. Thus we welcomed the year 2012 with a drink made with magnesium pills, which we had purchased in Germany from Aldi. A good start of the new year! Our hopes were not fulfilled, the water level did not decrease. It rained the whole night, but we had a clear sunny morning. We had two options: To go back to the street and take a taxi back to El Chalten or to do the 5 days tour to the several base camps on the East side of Cerro Fitz Roy and Cerro Torre with our heavy backpacks, 20kg plus (Marion) or 30kg plus (Tommy and Alfred). But first we hiked up Rio Pollone one hour without our equipment. We hiked two days to the base camp of Cerro Fitz Roy, the Campamento Base Poincenot (GPS coordinates: S49° 16.883' W72° 57.467'). On the first day we visited Laguna Sucia, which means dirty lagoon. But it is everything but dirty. On the second day we hiked to Laguna de los Tres and to the southeast shoulder of Cerro Madsen up to 1500 meters. Both provide superb views to the East side of Cerro Fitz Roy and its surrounding pinnacles. When we came back to our tents from the Laguna de los Tres we heart a couple talking German who built their tent next to ours. Suddenly the Lady cried to Marion "I know your face". It turned out that this were Ilona and Karl from Saxony, which had been with us on Cerro Marmolejo exactly 8 years ago. The same team including Tommy! Cerro Marmolejo is the southernmost 6000er on earth close to Santiago de Chile. We had a nice welcome party in the evening with whiskey, chocolate, cheese and chips like on Cerro Marmolejo. Of course we talked a lot and we agreed to have a common dinner in El Chalten on January 9th 2012. Ilona and Karl did the same tour like we but unfortunately in the other direction. Alas we did not find Ilona and Karl on January 9th, what a pity! Our next destination was the camp Campamento Base de Agostini (S49° 19.967' W72° 59.253'), which is the base for Cerro Torre. We arrived in the early evening and thus we strolled few minutes to the Laguna Torre along the river Rio Fitz Roy. The views were dramatic besides the fact that the higher mountains including Cerro Torre were in clouds. To access Cerro Torre you have to cross the wide and rapid river. It is possible via a Tyrolean traverse. There were some people waiting for something and we asked about the reason. A climber had broken his leg on the ascent to Cerro Torre today. A team of mountain rescuer fetched him already and take him now to the Tyrolean traverse. The team waiting on the river was going to carry him the 4 hours down to El Chalten, even in the darkness. We were very impressed that a mountain rescue was done on the same day of the injury. A very good job of the Argentine mountain rescue team. It was raining on the next morning. We were a little bit disappointed because it meant that we would not see Cerro Torre. We were running out of food, so we had to return to El Chalten today. We slept very long until the rain stopped. Finally we took breakfast and we watched other parties leaving the camp. Suddenly a small spot of blue sky came from South. We decided that we try it and we go to the viewpoint Mirador Maestri. When we arrived at the Laguna Torre the blue sky became bigger and bigger. Suddenly all clouds disappeared miraculously and we were speechless about the gorgeous scenery. Of course we went to the viewpoint Mirador Maestri, which provides outstanding and stunning views to Cerro Torre and the whole range (GPS coordinates: S49° 18.993' W73° 00.306'). January 7th 2012 was again a fine day. Our idea was to climb up Loma del Diablo (GPS coordinates: S49° 10.066' W72° 59.255'), the back of the devil. It is few kilometers Northeast of Cerro Fitz Roy. of According to our Rother guidebook this 1750 meters high peak provides marvelous views, but there is an entrance fee of 12.5 U$ because it is situated on private land! This is an annoying issue in this area of Argentina, we had also to pay 17.5 bucks per person when we had hiked to Lago Electrico. More annoying was that the private ranger forbade us to go to Loma del Diablo. It is too dangerous, there is a strong wind in the afternoon and so on. But we could go to a viewpoint which is a walk of 1.5 hour in the direction of Loma del Diablo. We walked the good marked trail, continued it and continued it. There was no wind at all. There was no dangerous part of the ascent at all. After 4 hours we were on top of Loma del Diablo and we were speechless again about the unforgettable outstanding views. Our track to Lomo del Diablo is included in the GPS coordinates file of Argentina. We spent January 8th and 9th on the beautiful lake Lago del Desierto which is 40km North of El Chalten. This lake is surrounded by dense, jungle like vegetation. On its west shore the glaciers coming down into the forest.